> Language > Cursive vs. Printing: Is One Better Than the Other? Recently, one of my colleagues emailed me some interesting thoughts about cursive and asked for my input. I was happy to dive into this controversial topic! People are often surprised to see that cursive script is taught before print in many Montessori classrooms. In fact, the Montessori materials in numerous 3-6 classrooms are all in cursive: sandpaper letters, movable alphabet, green boards, chalkboards, and all handwritten materials. However, there are also Montessori schools that teach printing first and then cursive. Is one better than the other? Should cursive always be taught first? Here’s a look at some pros and cons of each. 1. Cursive writing is a more natural way of writing. The pencil flows along the paper without frequent stops within words. 2. Words written in cursive are clearly separated from each other. Run-on words are not as common in cursive. 3. The child who can read cursive can also read manuscript, but the reverse is not true. 4. Cursive is a better exercise for strengthening fine motor skills. The connecting letters help the child to produce smooth, rather than choppy, strokes with the pencil. 1. Print is much more widely used. Most books and educational materials use printing. 2. The printed movable alphabet is easier to use than the cursive one. The cursive movable alphabet is a sort of “imposter” cursive: the letters are formed in a cursive style, but they’re not connected. This can pose difficulty to a child who’s trying to transcribe a story written with the cursive movable alphabet. 3. A child may learn printing at home, but form some letters incorrectly. In terms of muscle memory, they might be better served by learning printed letters correctly first, before learning cursive. They may also be in situations where they are required to print (a testing form, for instance) when knowing cursive only would be a drawback. 4. Cursive is less legible and harder to read. Need proof? Any form that says “Please print”. Post offices prefer printed addresses for the same reason. 5. In terms of writing, it’s true that a cursive “b” and “d” look less like each other than their printed versions. However, current research into dyslexia and other learning disabilities show that there’s far more happening in the brain than a simple flip-flip. Children who struggle with reading and writing are experiencing a disconnect between the part of the brain that “sees” letters and the part of the brain that “identifies” letters. A child with dyslexia often has dysgraphia, which is difficulty with writing. Teachers once thought that having dyslexic children write with cursive would help them, because the cursive letters look more different from each other than “ball and stick” printing. However, it turns out that because of dysgraphia, cursive is much, much harder for the dyslexic child. The reason is, there’s a lot more to think about. Since each letter connects, the child has to not only form the letter, but think about which letter is coming next in order to join them correctly. Samples of writing by dyslexic/dysgraphic children in both printing and cursive show that cursive does not aid the dyslexic child. You will still see all the same issues with cursive that you see with print: letter reversals, variations in letter height, spacing problems, and being unable to position letters correctly relative to the line on the paper. That’s because dyslexia and dysgraphia are language processing issues, not vision problems. There are many other ways to strengthen fine motor skills than learning cursive. The question is this: is cursive necessary for the refinement of fine motor skills? Is it the best way to teach fine motor skills? We offer all sorts of work in 3-6, from small puzzle knobs and tweezing to punching and bead stringing. Is cursive a necessary addition to this mix? Since most of us learned cursive in elementary school, it’s obviously possible to do so without learning it in preschool. One common reason mentioned in favor of cursive is that it’s faster. I was delighted to find several studies online that concluded that cursive is not faster than printing. The fastest way of writing, interestingly, was a combination of cursive and printing that joined some letters but left others unjoined. I laughed when I read this, because that’s exactly how I take notes when I need to be writing quickly. 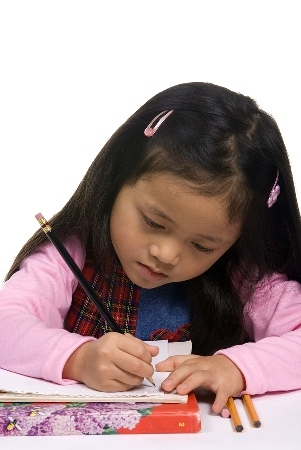 For many children, writing in cursive is much slower than using printed letters. Throughout most of human history, writing consisted stick figures, not circular or flowing figures (and the stick figures were not attached to each other). In at least two common forms of historic cursive, the letters are rounded but not joined (Hebrew Cursive and Latin or Roman Cursive). Cursive as we know it began in the mid-1700’s; almost yesterday in terms of humans and written forms of communication. Cursive is actually a recent development, and one that might be on the way out as technology continues to grow. Some schools have decided to use D’Nealian script – a sort of cursive/print hybrid – as an answer to the printing/cursive debate. I have no experience with D’Nealian, except that Sister Mary, my Montessori elementary trainer, felt that kids who use it never quite learn printing or cursive very well. She taught printing first and then started cursive at the beginning of second grade. My opinion is completely subjective, but I will say this: in the ten years of my teaching career post-training, almost everything Sister Mary taught me has been proven true, and the children in her classes always had beautiful penmanship. Can you tell that I have a bias towards printing? I tried to hide it but couldn’t. As a left-hander, I find it much easier to keep from smudging when I use printing (I think it has to do with the angle of the pen and paper needed for cursive.) While I was researching this issue, I began to feel that Montessorians continue to champion cursive is because it hearkens back to an earlier era in the history of the Western world. A time when all the things we value – beautiful penmanship, lovely manners, time spent in nature rather than in front of the television – were the norm for children everywhere. It’s one more way for us to be anti-culture. And there’s nothing wrong with bucking current trends, as long as our decisions are truly beneficial to children, and not just for the sake of being different. Please share your own experiences with printing, cursive, and handwriting in general. I would love to hear opinions on both sides of the debate. Let’s learn from each other!